Over at Mike Johnston’s The Online Photographer, I came across a reference to a video by Ben Lewis, about ultra high-end fine art photographer Andreas Gursky. Gursky’s typically massive prints have sold for record-setting prices at auction, including the new all-time record some of you recently may have read about: $4.3M for “Rhein II”, print 1 of 6. You can read more about it in the TOP postings I linked. I’ve been in some discussions recently on subjects such as whether or not to do limited edition photographic prints, whether using graduated neutral density filters (GND’s) is more “real photography” than using High Dynamic Range (HDR), and various other cuts at what makes photography photography, why art is art, etc. I found the occasion of the “Rhein II” sale and viewing the video about Gursky’s work slots right into my thinking about these topics. Gursky’s style has been described in terms such as dispassionate observation, full of detailed realism, straightforward depiction of unmanipulated, banal scenes, and so on. However the reality of his creative process is that he has an extremely painter-like sense of visualizing and composing his scenes, including (for some years) extensively “Photoshopping” in or out elements that meet or don’t meet the vision he has for his final works. Sometimes I do wonder if the art market’s lack of discrimination regarding Photoshop is actually an indicator of a lack of sophistication… […] They do tend to be impressed by confabulated artworks that only look like photographs but aren’t. It’s a sort of false power, similar to, I don’t know, maybe similar to being fooled by lip-synching at a supposedly ‘live’ concert or something. The digital darkroom adds a new wealth of creative potential, enabling the photographer-as-artist to express something in a distinctive way. Having said that, I think there is a point at which a work ceases to be photography (or certainly, traditional photography) and instead becomes a hybrid artform. But the simple fact of “manipulating” an image (which I’m not attempting to define here) doesn’t make it cease to be photography, in my books, any more than the manipulation makes the image necessarily a work of art. I watched as Andreas Gursky put together his next masterpiece in front of my eyes, with some folded contacts and sticky tape. I realized it wasn’t that Gurskies looked like everyday reality, it was that everyday reality looked like Gurskies. And when reality doesn’t live up to Andreas’ high standards, he just creates it. Despite Gursky’s own self-described nature of being an objective observer who sees reality, he is clearly interpreting reality through the lens of his own creativity. Lewis’ narration concludes: “I now knew he wasn’t the detached analyst of post-modernism and globalism that people said he was. He seemed like a nice chap, and he drove a fast car.” (I like that last bit. 🙂 ) Lewis saw that Gursky wasn’t just setting out to make factual, documentary records with his photographs, even though Gursky claims in the video that the “whole point” is to be objective rather than try to create “art”. Which is it — art or photography? Manipulation or reality? Or, can it be all of these at the same time? One might ask whether it matters what label we stick on things. In the case of specific artworks, perhaps not so much. The reason it comes up is because, alone of the visual arts, photography has this popularly perceived but conflicted relationship with objective reality. Many people seem to want to believe that photographs show “how it really was”. “A picture doesn’t lie” — how often has that been said or written? And of course, we portray and view photographs this way in all kinds of contexts like journalism, documentation, medicine, science, education, and more. Yet a picture can lie, if its creator sets out with the intention to mislead. Or even if the picture (i.e. its photographer) simply innocently represents things in a way that allows viewers to develop all kinds of false assumptions about what was really going on. My own view is that I’m not that interested in focusing on absence of manipulation as proof of the integrity of a photograph. There is always some kind of manipulation involved by the very act of taking this photograph rather than that one, at a given moment in time. Rather, I’m interested in the integrity of the photographer-as-artist. I want to be able to trust that the photograph’s creator is showing me something valid that I can respond to, whether I “like” what I see or not. 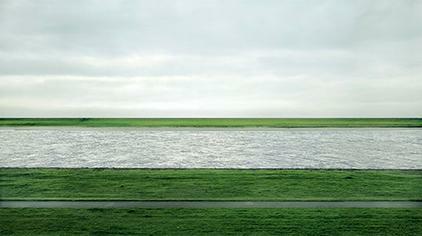 And in that respect, Gursky’s work (from what I’ve seen of it) satisfies me as being the “real goods”. Call me a cynic, but there seems to have been confusion here between intrinsic value and raw physical size. Huge isn’t necessarily great, as shown by last night’s television footage of an enormous meeting room filled with thousands of North Korean military men robotically applauding the country’s [now thankfully defunct] dictator. I began to notice an apotheosis of the banal in “art” photography in the 1970s, and it seems to have continued.